There are a number of ways to measure walkability–we’ve talked about Walk Score and Walk Appeal before–but none is more fitting for this time of year than the “trick-or-treat” test. Are the front doors easily accessible from the sidewalk? Is the neighborhood dense enough for children to quickly get from one house to the next? Is it safe? Do cars travel relatively slowly, and is there adequate space separating them from pedestrians? Is crime low in the area? These are questions that tell us more than just the atmosphere of a neighborhood for trick-or-treating; they inform us of walkability in the much broader context. The qualities that make a neighborhood a good place for kids to trick-or-treat are the same qualities that good, walkable neighborhoods have in general. Philadelphia is home to many such neighborhoods. In fact, in a list of the top cities for trick-or-treating, Philadelphia was cited as the 9th-best, according to the real estate website Zillow, which came up with the rankings. 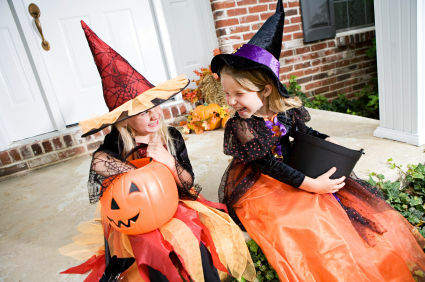 They also ranked each city’s neighborhoods based on a combination of factors to determine the parts of the city in which kids would be likely to get the most Halloween candy with the least amount of walking and the fewest safety risks. For the record, their top neighborhood for trick-or-treating in Philadelphia was Chestnut Hill, so grab your Halloween tote bags (ok, empty pillowcases) and hop on the regional rail on October 31st!